Women’s lives are continually bettered by access to healthcare and threatened by anti-abortion extremism. Before Roe v. Wade protected access to safe and legal abortion services, women of all social positions lived in fear of unwanted pregnancy. In Virgin Hall, the author remembers that fear and gives voice to the stories of women grappling with life-altering decisions. Virgin Hall is a woman’s coming of age story set in the 1950s and offers a window into social and sexual mores of the times. Sheila, the heroine, a sheltered girl from Brooklyn, is lost at first in the flamboyant college culture of the Southwest. Clothes, sorority rush, boys, and a great date were all priorities for “co-eds” of the day. As her three suitemates help Shelia adjust to life in a new social world, lifelong friendships are established along the way. Readers will learn that growing up then wasn’t all fun and games, even for sheltered young women of privilege. Sexual violence, racist norms, and limited access to healthcare and abortion took their toll, and the consequences reappear when the friends reunite 30 years later. If you appreciate finely wrought prose and an honest look at times gone by, Virgin Hall offers both a cautionary tale and a tribute to women’s empowerment. 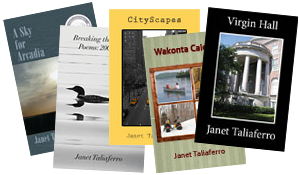 Learn more on her Amazon author page, connect with her on Facebook, or follow @JanetTaliaferro on Twitter.